It has both fixed and random maps stuffed in its bag, an FPS-style automap, and even controls that allow you to strafe from side to side in time honoured FPS fashion. It left the enemies, and the ability to shoot them in the face, at home however. Instead the player finds themselves racing against time, the one monster that mankind has never found a way to kill with a chainsaw. So it’s more of a First Person Spelunker, or a First Person Sprinter, or maybe a First Person ‘Splorer. Like a fair few dungeon crawl games before it, The Keep arms the player with a torch to lead their way to safety and discourage Grues. The race is on to escape this dungeon (a staggering 256 levels) before the torch runs out and the darkness does the player in. The Keep may have abandoned the guns and Cyberdemons but it has retained a long-abandoned aspect of First Person Shooters- keys, and the unlocking of doors with them. The concept is simple- doors stop you getting to where you need to be. Pick up keys. Open doors with them. Avoid getting eaten by night monsters. But there’s that timer to race against, marking time until your lamp coughs out its last breath and something nasty eats you. And there seem to be more doors than keys. It’s not as easy as it sounds. Keys disappear once used, and in random map mode where the game sometimes generates entirely pointless doors just to be sly it’s very easy to end up stuck in the dungeon waiting for something to eat you the second your lamp flickers out. The automap is a great addition to the game, and I was pleased to see it is updated based on what the player sees, not the player’s geographical position. Running down a corridor, eyes front, only reveals on the map the corridor itself, leaving any adjoining rooms undiscovered country. It’s hard to believe that game designer Kweepa, aka Steve McCrea (whose previous work includes Metroid Prime 1, 2 and 3), managed to fit all this intricate and entertaining gameplay into such a tiny package of data. It’s difficult not to talk about this game without mentioning Wolfenstein 3D. I’ve already done it twice in this review, with that last sentence making it a hat trick. 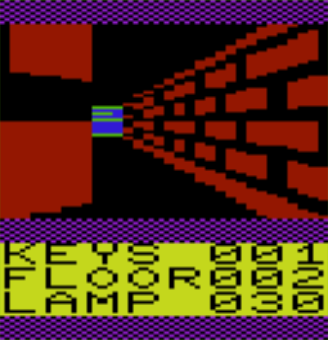 After all, the blues of the walls are pretty evocative of the castle’s corridors, and the Keep shares a lack of floor and ceiling textures with Apogee’s groundbreaking Nazi-smasher. So when I ran the game in random map mode for the first time, travelled about a bit then pressed I to bring up the map and get the lay of the land, I was amazed to see that the game had randomly generated walls in a rather familiar shape! The Keep is a credit to its designer and to the little old Vic-20 as well; yet another homebrew game for a retro system that proves just how much can be done on vintage platforms. It has been entered in this year’s Minigame Compo in the 4KB size category, where it is currently the only contender. I certainly wouldn’t want to face up to it! Download the game here (from the announcement post on Denial). This game is quite simply amazing (no pun intended).